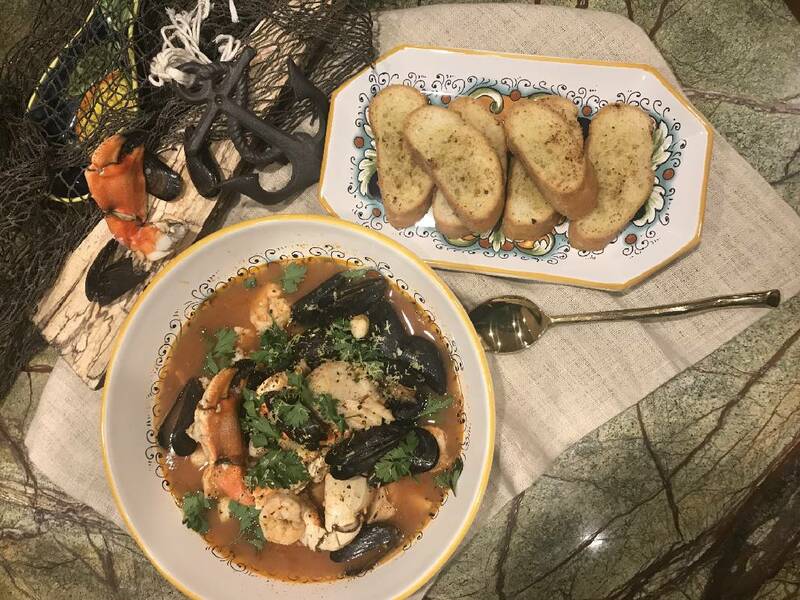 This hearty seafood soup is rich in flavor and fairly adaptable as you can use several combinations of seafood items like crab, shrimp, mussels and squid, if you can find them. BARRY SAYS: I love seafood. Just about any kind, so any dish that combines several types of deliciousness from the sea is fine by me. KELLEY SAYS: I don't totally agree, as there are some things I'm not fond of, but this is a wonderful dish with rich flavors, and you can pretty much choose whatever you want — or that you can find. I really wanted some squid, but I couldn't find any, and the recipe I based this on did not use crab claws, but I had some. BARRY: It's amazing what you have tucked away in the freezer and cabinets. In any case, this seafood soup was delicious on a balmy December afternoon. KELLEY: Yeah, it's a good, hearty, warm-you-up meal. Who knew it would be almost summerlike on the day we tried it. 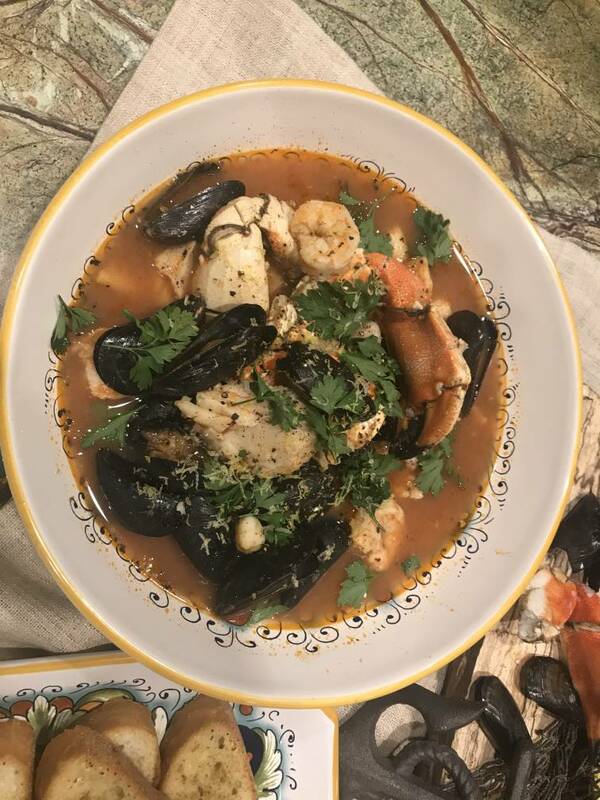 By the way, this is a version of cioppino, which is the classic Italian-American Christmas Eve meal. BARRY: Would you say it was an easy meal to make? KELLEY: Yes. I mean, all you do is cook the broth, then strain it, put the fish in and let it cook. BARRY: I had no difficulty eating it. Saute olive oil, garlic, red pepper flakes, onion, celery, carrot, parsley and shrimp shells in a pan for about 10 minutes. Add 1 1/2 cups wine, and cook for 10 more minutes. Combine tomatoes, salt and pepper, water, fish base and clam juice, and add to broth. Cook for 45 minutes. Return broth to pot and add remaining 1/2 cup white wine and Greek seasoning. Heat broth to a boil, and add cod and mussels first. Reduce heat to a simmer, and add shrimp, scallops and crab claws. Cook until firm, but not overcooked. Garnish with fresh parsley and lemon zest. Serve with garlic toast. Serves 4 people. Contact Barry and Kelley Courter at bcourter@timesfreepress.com or 423-757-6354.